Ile aux Cerfs Island, known in English as the deer island is an island near the east coast of Mauritius in the Flacq district. It was once populated with deer imported from Java and hence the name. 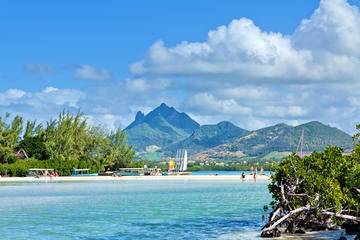 This is the best island of Mauritius which constitutes of around 100 hectares of land. Bountiful with the beauty of the clear water, green lands and natural waterfalls, it is a must place to visit on your trip to Mauritius. The Ile Aux Cerfs beaches offer several water sports activities like surfing, water skiing, glass bottom boat tours, banana boat rides and more. If you are not interested in sport activities then you can just swim or snorkel in the waters around the island or find a quite spot for sunbathing. There are many restaurants on the island offering a wide range of international as well as local cuisines. Unfortunately the food is reported to be mediocre and very expensive, but you’ll not lack for variety. There is also a five star hotel with lush green golf course, all making this amazing island, the perfect setting for a relaxing day. The coral reefs is beautiful and full of marine life, and beautiful large black rocks into the water, it is a perfect place to snorkel and to enjoy the beautiful underwater world. The island is also the best place to experience Mauritian golfing while seeing the awesome views of the lagoons and the clear Indian Ocean water all around, as it has 18 holes golf course. In IIe Aux Cerf you will find many tour organizers who organize the full day tour in which they offer a variety of transportation methods and activities. You can reach there by yacht or catamaran, speed boat, and for those who can afford it, by helicopter. Most of the tours organizers include lunch and beverages throughout the day which is relatively economic alternative for the high prices of food and drinks that you will pay on the island. Visiting Île aux Cerfs is considered a must-do whenever you visit Mauritius, as there is a saying about the Île aux Cerfs: God made this island paradise first and the rest of the world second. You will have an unforgettable experience which you can share with your family and friends and cherish all your life.